I purchased 2 sets of glasses. One for red and one for blue spectrums. Great price and both work fantastically, small price to pay to save my eyes. These are a must for any serious laser projects. I am still a very satisfied customer. Both laser and goggle work as advertised and are of excellent quality. The mode shifting stopped when I threw out the old rechargeable battery's. I put in new ones and it works as good as new. I purchased my Viper 125mW laser and laser safety glasses for my son for Christmas, Andrew loves it. It is a high quality laser and it is one of those gifts he never gets tired of. I use it to! The shipping was also very fast. Thank you!! Dragon lasers is a great place to shop for ur high power lasers needs. Products as described, work nicely, cheap shipping, and good service. I also purchased the cool looking Green and blue laser beam protection – Laser safety glasses and it really helps a lot. I am able to see perfectly the object and the laser dot. Without it, it's too bright to look at the object the laser beam hits. With the eyewear, the dot is small and there is no glare. I have purchased one of these laser safety glasses to protect my eyes from the hulk 125mW's beam. The shipping was extremely fast and the package arrived at my home 5 days after I placed my order. The laser safety glasses made the dot appear like a dim yellow dot, but allows a high visible light transmission of the other wavelengths, preventing other objects from being dark. Laser safety glasses are useful and can be very important when using a class 3B (> 5mW) or class IV laser (> 500mW). 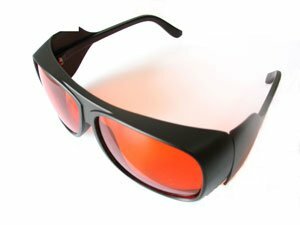 For anyone purchasing a high-powered laser, these laser safety glasses are a must to protect your eyes. In addition to protecting your eyes, it makes you look "cool" and fun to tell your friends that you need to wear safety glasses to operate your laser! If you have decided to purchase laser safety glasses, remember not to deliberately point your laser into the glasses as it might destroy it of the laser power is high enough. Ich habe den 125mW Viper Laser zusammen mit der Laserschutzbrille gekauft. Die Bestellung hat wunderbar funktioniert. Direkt nachdem ich online bezahlt hatte, erhielt ich eine Bestätigung, dass alles geklappt hat. Kurz darauf wurde ich von einem sehr freundlichen Mitarbeiter angerufen, der mir den voraussichtlichen Liefertermin mitteilte und mich auf die Gefahren der Laserstrahlung hinwies. Das hat mich sehr gefreut. Ich habe an einem Mittwoch bestellt und den Laser - sorgfältig verpackt - am nächsten Dienstag bekommen, also echt sehr schnell. Man konnte online schön nachverfolgen, wo sich das Päckchen gerade befindet. Wenn ich irgendwelche Fragen hatte, wurden diese bis zum nächsten Tag freundlich beantwortet. Also echt super Kundenbetreuung! Also, der Laser ist echt der Wahnsinn und so gestört hell!! Wenn ich aus etwa 5m auf eine weisse Wand strahle, ist der Punkt so derart hell, dass man ihn nicht anschauen kann! Das ganze Zimmer ist dann grün ausgeleuchtet, nur von diesem Punkt aus! Der Strahl ist auch bei Tageslicht gut sichtbar. Rote Streichhölzer entzündet der Laser aus einem halben Meter in etwa einer Sekunde! Man kann schwarze Luftballons aus 8m Entfernung noch zum platzen bringen! Ich bin vollkommen zufrieden mit meinem Laser und würde immer wieder bei dragonlasers bestellen! Der Laser hat echt eine super Qualität und die Kundenbetreuung ist hervorragend! Ich könnte mich den ganzen Tag mit meinem Laser beschäftigen und immer andere Sachen anbrutzeln. Ich würde jedoch jedem empfehlen, immer eine Schutzbrille zu tragen! Die Laserleistung ist echt enorm! Strahlt man an einem sonnigen Tag nach draussen, ist der Laserpunkt an einer etwa 400m entfernten Hauswand immer noch deutlich zu erkennen! Mein alter roter 1mW Laserpointer von hierzulande macht da schon nach 50cm schlapp. These laser safety goggles do exactly what they are supposed to do. While wearing them I feel completely safe doing anything with my laser. They fit comfortably and also, in my opinion, make everything look much cooler! My favorite part is that the sky appears to be yellow. If you are planning on buying a high powered laser don't hesitate to buy these. They may make the difference in some situations.